Joe Haden missed most of the second half of the Bears game with a hip pointer and missed practice Wednesday and Thursday this week. BEREA, Ohio — Many times in the NFL, late season games that seem meaningless, are opportunities for young players to show what they can do. Case in point is free safety Tashaun Gipson. As an undrafted rookie free agent last season, he was able to show enough in the final games that gave the new coaching staff enough confidence to go into the 2013 season with him as the starting safety opposite T. J. Ward. Gipson has blossomed and earlier this season, defensive coordinator Ray Horton called Gipson the ‘MVP of the defense’. 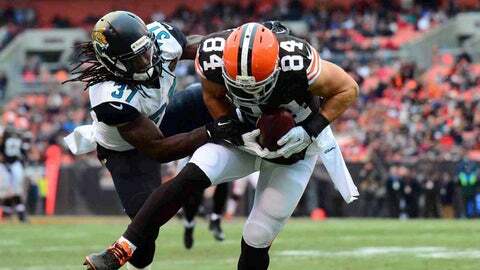 Last week, Gipson had two interceptions and returned one 44 yards for a touchdown. Horton termed Gipson’s performance from last week at a ‘Pro Bowl level’. Joe Haden missed most of the second half of the Bears game with a hip pointer and missed practice Wednesday and Thursday this week so far. If he can’t play, the spotlight turns to rookies Leon McFadden and Julian Posey. McFadden knows his role will increase if Haden doesn’t play, as he would move to the No. 2 corner and Posey would move to No. 3. "If Joe can’t go, I have to step up and handle my job," McFadden said. "I have to take care of my assignment. Joe’s a great player, but it’s the next man up to step up." Horton knows whether McFadden starts opposite Buster Skrine or is the third cornerback with Haden in the game, teams will find him. 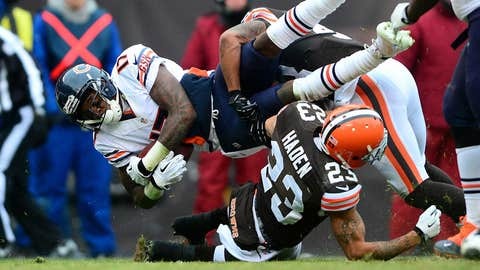 "I believe it’s going to be a game-time decision (on Haden)," Horton said. "Knowing Joe, if he can play, he will. He’s doing everything he can, to play. "He’s definitely the hot corner as a rookie," Horton said. "They are going to go after you. I’m sure he knows he’s a target." McFadden has already experienced that. With the game on the line two weeks ago, against the Patriots, Tom Brady threw deep to Josh Boyce and McFadden was called for pass interference to set up the Patriots winning touchdown. "Every play I have to pay attention," he said. "I feel like I have a target on my back, so I have to respond and get that target off of me." McFadden had a key pass interference penalty called against him last week for 30 yards as he grabbed Alshon Jeffery down field to set up a fourth quarter touchdown. "Every play, I think the ball is coming my way," McFadden said. "I have to trust my athletic ability and turn my head around and see the ball." McFadden played mostly on special teams until Chris Owens was injured and put on injured reserve. This week, Owens was waived-injured and the Dolphins signed him to the active roster. McFadden was drafted in the third-round this year from San Diego State but until recent games wasn’t in the rotation. He suffered a leg injury in training camp and got behind, but he said he stayed mentally on top of his game. "Back from training camp, I had an injury and I tried to stay mentally sharp and pay attention to detail that helped me." McFadden had six tackles against the Patriots in his first extensive action in the secondary, but had the costly penalty. He started last week against the Bears as the Browns started in the nickel package. He had two tackles. Posey has been on and off the Browns practice squad, but most recently was added to the active roster on Dec. 3 and has played the last two weeks. He has a tackle in each game, including a sack last week against the Bears. Posey played at Ohio University and was an undrafted rookie free agent signed by the Dolphins who was released in training camp. He is the brother of former Ohio State wide receiver Devier Posey. "(Playing the last two games) has been a big learning experience for me," Posey said. "Every play I get, the more I get better. I feel that I’m growing fast." Skrine and Gipson are confident in both of the young players. "Joe is a play maker, but McFadden is getting better every week," Skrine said. "So is Posey, both guys are developing." "It truly is the next man up," Gipson said. "I think we have guys capable of making plays. If they come in with an opportunity and are self accountable, they can play well." Both McFadden and Posey are eager to show they belong in the NFL. "It’s an opportunity to take advantage of," McFadden said. "I want to do my assignment." "I feel like I’m prepared and know that I’m ready," Posey said. "Our mantra is next man up. I’m happy for the opportunity." Cleveland fan-favorite Josh Cribbs was signed by the Jets but won’t play against his former team due to a season-ending injury he suffered in Week 12 against Oakland. Cameron Remains Out: TE Jordan Cameron (concussion) remained out of practice. DB Joe Haden (hip pointer) was on the stationary bike, but was seen on the field after practice with the defense going through the walk through. OL Joe Thomas (back) was practicing, as was LB Eric Martin (illness). Others still not practicing were OL John Greco (knee), WR Davone Bess (illness) and TE Andre Smith (calf). Speedy Recovery: Chudzinski said that DL Desmond Bryant is recovering well from the procedure to remedy his irregular heartbeat. "I have talked to Desmond, and I’ve seen him a number of times afterward," Chudzinski said. He’s doing fine, and he’s excited because obviously, it was something that was on his mind and he was concerned about, but it’s past him now with that procedure being done. He’s expected to be back 100 percent and better than ever." Bryant was off to a fast start with 3.5 sacks in the first part of the season, but dropped off in sack totals. Chudzinski was asked if that affected him. "I know he was concerned about it, so maybe it did," he said. "I don’t know. I can’t say that. Just telling in the pep in his step, he’s excited about the future right now. "I think we saw signs of that," he said. "I know he was battling some nagging injuries, as well, so some of that I know plays into that. Again, I’m just excited about him getting back and being full speed and getting going again because he’s another guy with a bright future." Bryant did lead the team with 32 quarterback hurries when he was placed on injured reserve. Former Browns: With the Browns lack of consistency at WR, Chudzinski was asked why the Browns were so quick to release WR David Nelson at the end of training camp as he was coming off the ACL injury. "Those are always tough decisions down at the very end," Chudzinski said. "We just didn’t have a lot of time. He missed a lot of training camp so it was a difficult decision. I really like David as a person, and certainly, he’s been able to get back into it and being able to play. I’m happy from that standpoint for him personally that he’s been able to do that, but those are the types of decisions when it comes down to that point of, who you have, are they ready to play right away in games early in the season and then the rest of the roster you’re trying to balance with all of those things." Nelson was signed by the Jets after the season began and he has caught 27 passes for 324 yards (12.0 avg.) in 10 games, good for third-best on the team. Nelson didn’t sign with the Jets until Oct. 2. 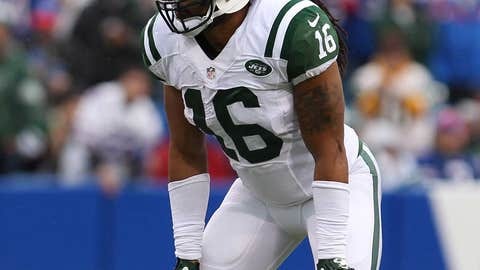 Other former Browns on the Jets, WR/KR Josh Cribbs was signed by the Jets but was injured and lost for the season on injured reserve. Cribbs played in six games with 8 special teams tackles. Cribbs had 20 kick returns for 490 yards, including a 42 yarder. He returned 8 punts for 96 yards, Cribbs rushed 13 times out of the ‘wildcat’ for 55 yards and caught two passes for six yards. TE Kellen Winslow has 27 receptions for 319 yards with two touchdowns.